1 of 5 In large pot, bring chicken broth to a simmer. 2 of 5 In large, heavy-bottom pot, heat oil over medium heat. Add onion; saute 3 minutes. Add garlic; saute for 2 minutes. 3 of 5 Add rice to onion, stirring to evenly coat with the oil; cook for 1 minute. Add wine and salt; cook, stirring constantly, until all the wine is absorbed, about 5 minutes. 4 of 5 Add 2 cups of the simmering broth to the rice. Stir over medium-high heat until all the liquid is absorbed, about 5 minutes; the mixture should remain at a low boil. Add the remaining broth, 1 cup at a time, stirring continuously, until all the broth is absorbed before adding the next 1 cup broth. All the broth should be absorbed after about 25 to 30 minutes of total cooking time. The mixture should be thick and creamy and the rice tender. 5 of 5 Remove 4 cups of the warm risotto and transfer to a large bowl. Cover the pot with the remaining risotto and remove from heat. With rice in bowl, quickly proceed with steps 1 and 2 of Tex-Mex Risotto Cakes with Yogurt-Cilantro Sauce (see recipe www.familycircle.com). 1 of 1 Into remaining risotto in pot, gently stir peas, prosciutto, oregano, Asiago and nutmeg. 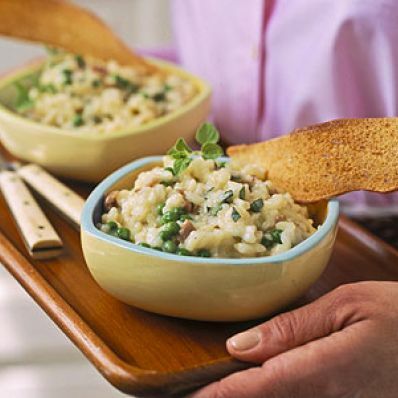 Serve risotto immediately with slices of crusty bread and green salad. Makes 6 servings.